Sumo Wrestling is one of the world’s most distinctive forms of wrestling. Originating in Japan, Sumo can trace its roots back to the Edo period of Japan’s history (circa 1603) and was a popular form of entertainment. The original wrestlers were almost certainly ronin, samurais who had no lord or master and they would have competed as Sumo would provide them with a source of income. Sumo is considered a martial art in Japan but is more accurately described as a sport, but one which still retains many of the ancient traditions of the Shinto religion as can be seen from the rituals at the beginning of every Sumo bout. The object of Sumo is simple. To force your opponent out of the ring or force your opponent to the canvas. However, behind this deceptively simple objective lies a complex and fascinating sport in which there are plethora of techniques and practices that wrestlers can use to win their match which elevates it far above a simple test of strength. As well as the sporting aspect of Sumo Wrestling however is the fact that as a sport, it is very closely associated with the Shinto religion and this can be seen at the beginning of every Sumo bout where wrestlers perform a certain set of moves that include leg raises and claps. The claps are traditionally meant to show their opponent that they are not hiding any weapons and that they wish to meet in a fair fight. As well as this, salt is also thrown by both fighters into the ring. Salt is important in Japan’s Shinto religion and is used to purify, and each wrestler throws it to help drive away evil spirits. The first thing that anyone notices about Sumo is the size of the competitors. Unlike nearly every other sport in the world, in Sumo, being as big as possible is not just advantageous, it is a requirement if a competitor is to be successful. Despite being so fat, Sumo wrestlers are surprisingly light on their feet but despite the fitness required to be a Sumo wrestler, the fact that they carry so much weight does catch up with many competitors, with many developing high blood pressure and Type 2 Diabetes later in life. The only equipment requirements in Sumo are that all wrestlers wear a mawashi which is the loincloth that is made from tough, heavyweight fabric. Wrestlers are also expected to grow their hair long and wear it in a chonmage (topknot). No points are scored in Sumo, as Sumo is a simple win/lose format in which there can be no tied bouts. 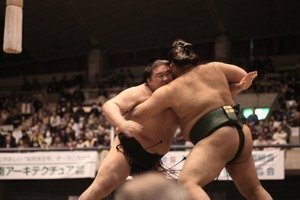 However, there are various levels of Sumo Wrestler dependent upon ability, and they exist effectively in six divisions in which promotion and relegation is possible every year. Wrestlers are awarded points depending upon their performance at the main Sumo tournaments which then affects their ranking within their division. A Sumo match can be won in a number of of ways. Firstly, you can push your competitor out of the ring. Secondly, you can grab your opponent's belt and force them out of the ring by pushing them or throwing them. Thirdly, you can force your opponent to the canvas. These are the three main ways (and there are multiple variations of each one), although a match can be won by disqualification or if one competitor is not deemed fit to continue. It is not possible to draw a Sumo bout and matches very rarely last more than a minute. Sumo bouts take place in a ring that is approximately 15 feet in diameter and is raised on a block of clay that is known as a dohyo approximately 2.5 feet above the ground. Each Sumo bout must begin with an elaborate ceremonial ritual in which the wrestlers both perform certain actions and throw salt into the ring. Once the ritual is over, the two wrestlers face each other and wait for the referee to begin the action. Both wrestlers are to crouch with fists on the floor until the referee signifies the start of the match. Both fighters then engage with each other in an attempt to win the bout. As soon as one competitor has been forced out of the ring or to the floor, the match is over and the referee announces the winner as well as the technique (kimarite) that was used to win the fight. Contestants can also lose a Sumo fight by using an illegal technique (known as kinjite) or if their belt become undone.